By Natalie Novick , February 12th, 2019.
iFarm distinguishes itself from other offerings on the market for both their hardware and software that facilitates the cultivation of different crops in entirely closed ecosystems. Rather than integrating existing products, iFarm has developed their own multi-layered horizontal shelf system alongside a digital database of parameters to enable a fully automated microclimate. 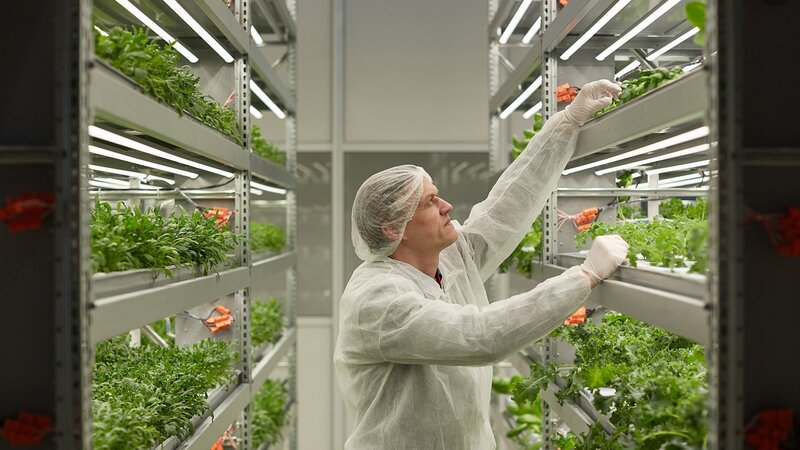 These “growing recipes” can be downloaded from the company’s central database, enabling anyone to grow crops without a comprehensive knowledge of agriculture. The iFarm system currently offers cultivation solutions for many different types of produce, among them basil, arugula, spinach, cilantro and strawberries. Alongside their current offerings, the company has plans to apply its technology to the floriculture industry in the near future. iFarm’s vertical farming system can be scaled to build modular farms of nearly any size. A cloud-based management system optimizes conditions for each farm, letting crops grow successfully in any type of available space, including basements, building roofs or spare rooms. In addition, their internal closed contour technology has been primarily designed to ensure a sterile growing environment. In fact, the company claims no pesticides are necessary inside their farm modules, and vegetables grown inside their farms do not need to be washed before consumption. “The investments from this round will be used to develop technology and expand our team, including our engineering, construction and agro projects teams, as well as to pilot the technology on the European market,” explained Alexander Lyskovsky, iFarm founder and CEO. Lyskovsky is one of Russia’s most well-known serial entrepreneurs. He previously co-founded Alawar, one of the country’s largest game development companies, and Welltory, an app used worldwide that allows users to monitor stress levels.